PC Panel is an enclosure use to keep the computer set for controlling a machine. 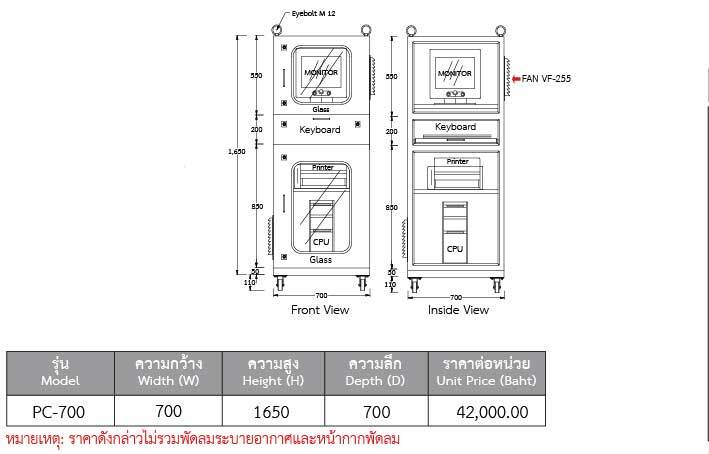 The panel are divided into 3 parts which the first part is the upper panel that suitable for keeping the computer monitor, which the user can monitor the system through the glasses in the front. The second part is suitable for keeping the computer keyboard which it is easy for sliding in or out. The third part is suitable for keeping the CPU and printer. It is made from a cold rolled steel sheet with 1.5 mm. thickness and strengthening with 3 mm. thickness for structure. The door can open both front and back side. In addition, the enclosure base have four castors for easy moving (with 2 breaks and 2 without breaks) which can loaded about 200 kg. The user can reduce the temperature inside the enclosure by installing the air condition or the ventilation fan.